South Korea’s per capita gross national income (GNI) surpassed $30,000 for the first time last year, a milestone achieved in 12 years after it passed the $20,000 mark in 2006. According to preliminary data from the Bank of Korea (BOK) on Tuesday, the nation’s per capita GNI reached $31,349 last year, up 5.4 percent from a year earlier. It is the first time for the country’s per capita GNI to exceed the $30,000 mark, indicating Korea has joined the ranks of advanced economies. The milestone has been achieved in 12 years after the nation’s per capita GNI passed the $20,000 milestone in 2006 – which took longer than other countries as it was hit by the global financial crisis. It took Japan and Germany each five years and the United States and Australia each nine years for their respective per capita GNI to rise from $20,000 to $30,000. GNI per capita is the total value of income earned by residents of a country in a year, divided by its population. It reflects the average standard of living in a country. The BOK projected that it will take Korea 10 years or less for its per capita GNI to reach $40,000 given its economy continues to grow at potential growth rate. It remains skeptic, however, that Korea will maintain its potential growth rate level given a fall in the working age population, aging society, and slowdown in economic growth. Experts also noted that although Korea has joined the ranks of other advanced economies in terms of per capita GNI, economic sentiment of households is worsening, with widening income disparity between the wealthy and the poor and lack of quality jobs. The BOK, meanwhile, also confirmed on Tuesday that the country’s gross domestic product (GDP) grew 2.7 percent last year, matching its earlier estimate released in January. 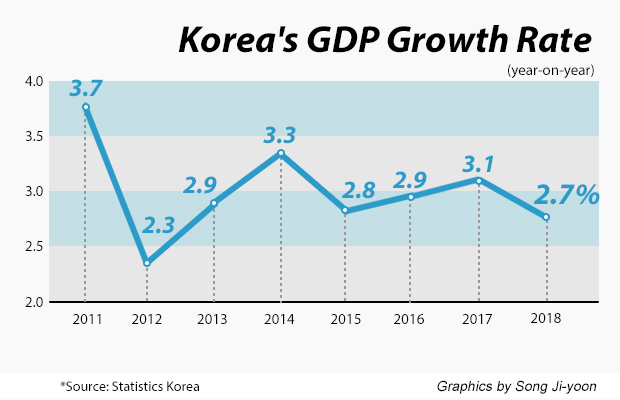 Korea’s economy expanded 3.1 percent in 2017. BOK data showed private consumption was up 2.8 percent in 2018, the highest since 2.9 percent growth in 2011, and government expenditure up 5.6 percent, the highest growth in 11 years. Construction investment, however, fell 4 percent last year from a year earlier, marking the lowest since 1998. Facility investment was also down 1.6 percent to lowest since the global financial crisis in 2009, although conditions improved in December, last year, to increase slightly from its estimate in January.